Can creativity ever be managed? Shouldn’t it be a spontaneous process that happens when a flash of brilliance strikes somebody? How can one be creative if one is an engineer/accountant/mechanic? Step 1: Ask – This entail identifying and clearly defining one’s specific Creativity Challenge (the creative project identified for action) and learning how curiosity and awareness can be driven in one’s team. A key part of this is the development of a Creativity Brief that articulates and directs one’s effort. Step 2: Prepare – The next step is to develop the mental and physical attributes necessary for the creative process. This includes the clearing of mental and emotional hurdles to creativity, creating a physical environment that is positioned for maximum creative output, and building a supportive culture. Step 3: Discover – This stage looks at how creative ideas could be bubbled to the surface through concepts like the Borrowed Idea, inflection points, Upside Down, and patterns to trigger one’s imagination. Step 4: Ignite – The real act of generating ideas comes here, with all kinds of techniques ranging from Imbizo groups, the Hot Potato and the Wrong Answer, which are then elaborated into fully formed ideas with techniques like EdgeStorming, RoleStorming (imagine if you’re Steve Jobs, what would he say?) and Brain Writing. You can find these examples and more here. Step 5: Launch – In the final stage, one’s analytical left brain is reconnected with the creative right brain to look at tasks like selecting the best ideas, developing KPIs for measuring them, and building an action plan to realize them in a fruitful and productive manner. In my opinion, the most useful part of the book is the section on ideation (Ignite). Here, Linkner provides useful tips like the Eight Commandments of Ideation (Thou Shall Not Judge, Thou Shall Not Comment, Thou Shall Not Edit, Thou Shall Not Execute, Thou Shall Not Worry, Thou Shall Not Look Backwards, Thou Shall Not Lose Focus, Thou Shall Not Sap Energy) and techniques on brainstorming. I particularly like the method created by Alex Osborn with the acronym SCAMPER, i.e. Substitute, Combine, Adapt, Magnify or minimise, Put to other use, Eliminate, Rearrange or reverse. To strengthen his key thesis, Linkner cites numerous examples of companies and individuals which have embraced creativity from Pixar, Cold Stone Creamery, ZipCar, Amazon, Quicken Loans, Tony Robbins, Intel and more. Many of these stories were fascinating. For example, one learns that Nintendo opted to build a device with a better game experience (Wii) rather than deliver the best graphics and sound to compete with Sony’s Playstation and Microsoft’s XBox (this was called the Upside Down concept of turning a problem around). 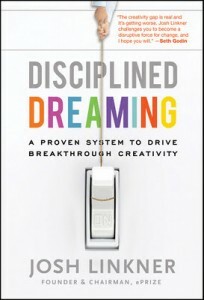 Compellingly written with lots of useful anecdotes and ideas, “Disciplined Dreaming” provides a good way to dive into the world of ideation, imagineering, and creative strategizing. Pick this book up if you’re looking to sweep away the cobwebs of run-of-the-mill business strategies and are game to turbo-charge your creativity processes.